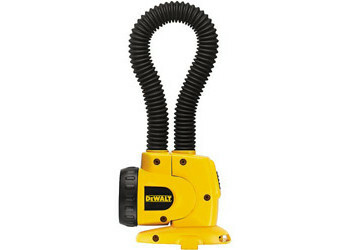 Dewalt Heavy-Duty 18V Cordless Flexible Floodlight. Wide-angle beam is brighter than traditional flashlights. Flexible neck allows for hands-free operation and light to be projected in any direction whether it is standing on its base, wrapped around a pipe, or hanging from rafters overhead. Lockable head clip offers versatility and convenience of a lantern. Extra-bright Xenon bulb maximizes brightness of the beam.